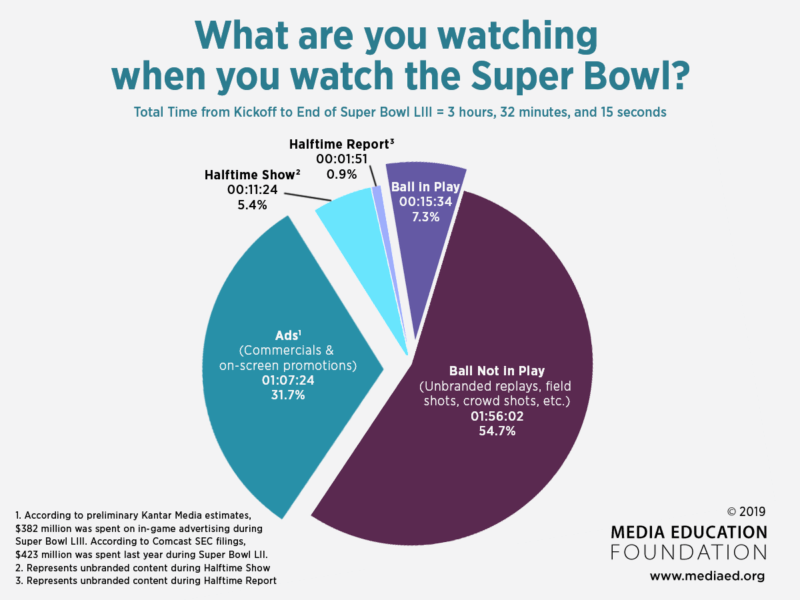 If you were one of the more than 100 million Americans who tuned into Super Bowl LIII this past Sunday, the time you spent watching ads absolutely dwarfed the amount of time you actually saw the ball in play. As in years past, the Media Education Foundation (MEF) crunched the numbers and found that over the course of the three-and-a-half-hour game, the ball was in play for a mere 15 minutes and 34 seconds, or roughly 7% of the entire broadcast. In contrast, almost a full third of the broadcast – an hour and seven minutes in all –was dedicated to ads, branded content, and other commercial clutter. CBS, which charged upwards of $5.25 million for a 30-second spot, or roughly $175,000 per second, raked in more than $380 million from all this in-game advertising. According to MEF Executive Director Sut Jhally, what matters most about these mind-bending numbers is how consistent they are with the overall commercialization of American culture. MEF has been producing videos for years on the multiple social, cultural, and political threats posed by hypercommercialism and unbridled consumer capitalism. If you’re interested in exploring these issues with your students, we recommend two recent MEF titles in particular: Advertising at the Edge of the Apocalypse, Jhally’s devastating look at how commercial logic has put us on a collision course with environmental and social catastrophe, and Digital Disconnect, acclaimed media scholar Robert McChesney’s eye-opening analysis of the myriad threats to democracy posed by the corporate takeover of the internet and the rise of surveillance-based advertising. Click below to learn more about these and a range of other MEF titles on the corporate colonization of American culture, and its corrosive impact on everything from public space and childhood to our food system, American sports, and the health of our democracy.